All fluid contact parts of a Vanton pump are injection molded or fabricated of solid, chemically inert, thermoplastics. These components offer significantly broader chemical resistance over the full pH range than components made of stainless steel and other alloys. Vanton pumps are therefore superior for handling of acids, caustics, solvents, chlorides, halogens and other corrosive or hazardous fluids, including mixed or unknown liquids, plant effluents and waste streams. Unlike metals, Vanton thermoplastics are inert, eliminating corrosion and assuring the integrity of ultrapure water, reagent grade chemicals and other fluids required by chemical and pharmaceutical manufacturers, printed circuit board fabricators, utilities and other companies whose processing operations cannot tolerate contamination. Vanton thermoplastic pumps also provide greater abrasion resistance than metals, making them superior for pumping of drainage sumps, containment areas, effluent collection vessels and other applications in which abrasive-containing fluids can be encountered. In addition, Vanton thermoplastics eliminate problems of wicking, absorption and abrasion associated with pumps made of fiberglass-reinforced plastics (FRP), and problems of tearing, cracking and peeling associated with plastic-lined metal pumps. As a result, Vanton pumps have no equal for safe, dependable handling of wastewater, caustics, acids and ultrapure liquids — the applications for which they are specifically designed and constructed. 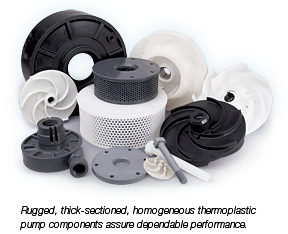 and no company offers as much experience with thermoplastic materials in pumping applications as Vanton. No galvanic corrosion or rusting. Metals corrode, Vanton thermoplastics do not. Superior resistance to abrasion compared to metals. Greater chemical resistance over the full pH range compared to metals. No ionization/metallic contamination of the fluid. No problems with galling. Easier maintenance. Significantly lighter than metal pumps, allowing easier installation and maintenance. No interbatch product contamination. Fiberglass composites wick and absorb by capillary action. Solid homogeneous thermoplastics do not. Superior resistance to abrasion compared to thermoset composites. Greater chemical resistance over the full pH range than thermosets.